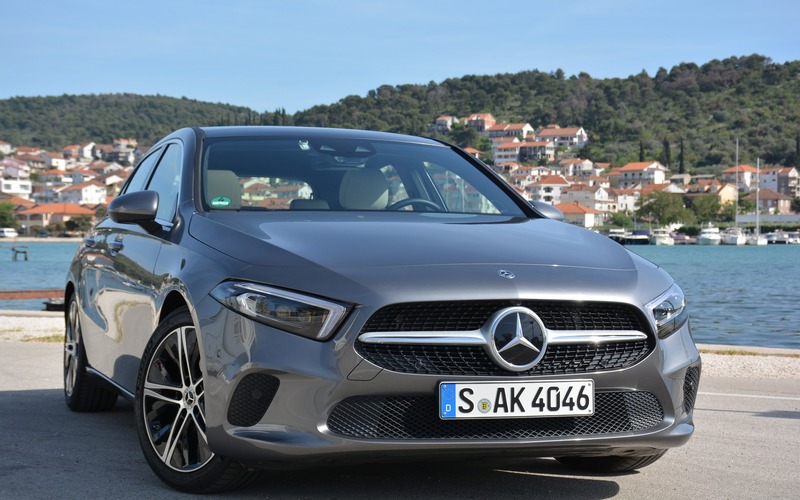 SPLIT, Croatia – If owning a luxury vehicle wasn't in the cards before, there's a new 2019 Mercedes-Benz A-Class compact offering that's aimed at disrupting the mindset of traditional mainstream buyers who've longed for a taste of luxury, while simultaneously striking at the heart of a younger generation. Recently, mainstream vehicles have gone upscale with luxury refinements at affordable prices, while on the flipside, luxury automakers including Mercedes-Benz provide similar bargains with its B-Class and CLA Coupe. Unfortunately, the latter have come with various compromises, such as not fully representing the level of sophistication Mercedes owners have come to expect in the C-, E-, or S-Class. Also: 2019 Mercedes-Benz A-Class: Yes, We’re Getting it! The A-Class—now in its fourth generation globally and the first one in Canada—attempts to change all that with an assault fuelled by good looks, loads of technology, refined interior space and splendid performance. It's obviously not at the levels of the aforementioned Mercedes staple products, but it resembles those upper-tier experiences more than ever before. Canada separates itself from its American friends by receiving the A-Class in both sedan and hatchback form (the U.S. only get the sedan) when it comes to market in November 2018. Outside of that styling choice, options are made easy for consumers with only one engine offering labelled the A 250: a 2.0-litre four-cylinder with direct injection that produces 221 hp and 258 lb.-ft. of torque that’s matched to a seven-speed, dual-clutch transmission. The only other major choice will come in standard front-wheel drive or available 4MATIC all-wheel drive with fully variable torque distribution. Overall, it has a sporty stance with a sloping silhouette built for ideal aerodynamics, with a class-leading drag coefficient of 0.25. 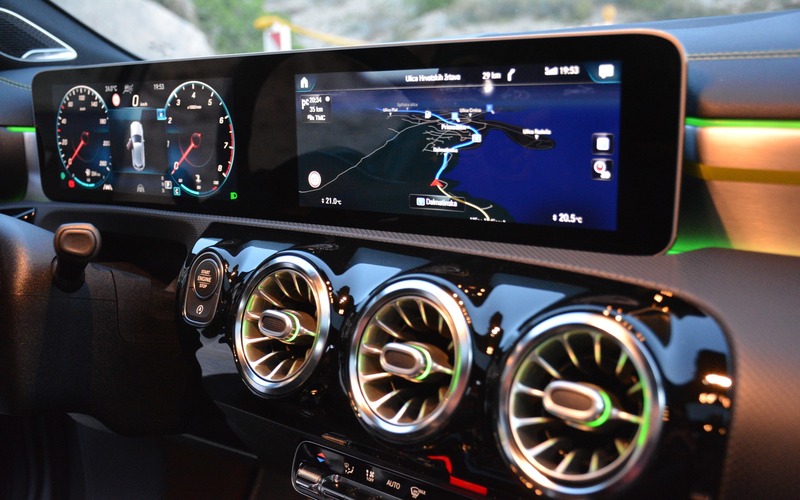 Unlike other markets, Canadians will be treated to a few standard elevated design enhancements in the A 250, including flat LED headlamps with chrome elements, diamond-shaped pins in its sleek radiator grille and 17-inch wheels. Only the five-door versions were on-hand for this first drive opportunity on the coastline of Croatia. 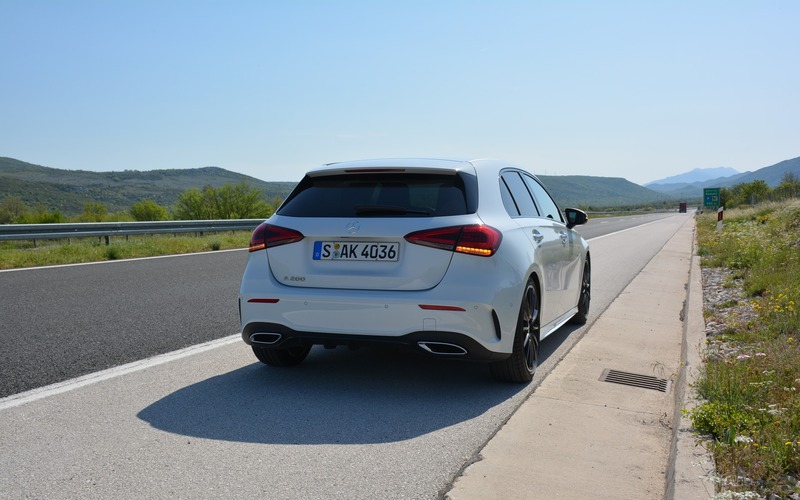 The destinations of Split, Trogir, Primosten and Sibenik provided a breathtaking view, but more importantly, a thorough testing ground for the A 250 allowing for a mix of highway, country and city with many twisting roads in between. The A 250's 0-100 km/h sprint of 6.2 seconds was pretty much confirmed on the Croatian highways with speed limit stretches of 130 km/h. The hatch breezed its way up to speed in comfort and in a surprisingly smooth fashion with seamless gear changes. Another key attribute is its calm and quiet sanctuary, as wind and road noise have been worked on to a tune of a 30% quieter result from the outgoing global model, thanks in large part to the position and shape of its exterior mirrors. The A-Class doesn't have much fault given its entry-level position. It handles like a champ with only small steering inputs needed. In addition, it possesses decent grip and balance with only a hint of body roll, brakes quickly and effectively with the bonus of standard Active Brake Assist, and can be aggressive or smooth when needed with Dynamic Select featuring four driving modes. When pushed above that 130 km/h speed limit, I had to do a double take at its wide and colourful HD instrument cluster for speed confirmation as that quiet acceleration not only distanced me from the rest of the traffic, but from any thoughts of its Audi and BMW competitors. It’s rare for an entry-level vehicle to be a starting point for new technology, but that's exactly what the luxury brand is doing with the introduction of its new standard MBUX system. By doing the opposite of the trickle-down effect, the A 250 makes an appeal to a younger demographic that the brand hopes will play a large part in upcoming sales. MBUX is a fully customisable multimedia system that can be controlled via touchpad, touchscreen, steering wheel buttons, or voice command. The latter's virtual assistant, similar to Google Home or Siri, can be activated by the phrase “Hey Mercedes” in English or in 23 other languages including Canadian French. It has the German brand all excited, but it does come with its own frustrations. Let's start with the good. The crisp and modern widescreen digital cockpit comes straight out of an E- or S-Class experience. A twin 7-inch display is standard or one can opt for the massive 10.25-inch unit that will impress all occupants. Its navigation stands out the most due to the implementation of an optional augmented reality technology that showcases a forward camera view of the approaching right or left turn, along with optional Traffic Sign Assist that imposes street signs onto the screen to avoid any missed turns. To further avoid complication, street numbers of buildings or houses are also shown, something that at least I've never seen before, and dare I mention again, this is an entry-level luxury car. The bad only comes down to the virtual assistant not understanding many of your questions. It managed to open sunroofs, turn the A/C down and activate the heated seats, but at times that took several attempts and some eventual failures when asking other questions in regards to tuning the radio or asking to drive to a point of interest. With time, the system should improve and the driver will get to know what it can and cannot do. In the meantime, I expect most drivers will turn to the touchpad or steering controls as their go-tos. The 2019 Mercedes-Benz A 250 comes to play with standard modern technologies unheard of in its segment. When it comes to market, it should make a significant impact to Mercedes' bottom line, pushing its B-Class sibling into Canadian extinction. Pricing and fuel economy ratings for the sedan and hatchback are expected to be released closer to its November 2018 arrival at dealerships. 7/10	No numbers have been released as of this first drive test. 7/10	Occupants will enjoy ARTICO man-made leather seating that places you in comfort for long hauls. Back-seat passengers will also feel that comfort, but be limited in legroom. 7/10	The 2.0-litre four cylinder holds its own on the highway and within the city with smooth acceleration. 10/10	It doesn't get much better than the twin HD screens Mercedes has on offer with an exceptional MBUX multimedia system. 9/10	The 2019 A 250 showcases many of the modern touches of an E-Class or S-Class, unheard of in an entry-level segment. If you're in the market for a reasonably-priced compact, it's hard not to opt for this latest home run from Mercedes-Benz. New Models 2019 Mercedes-Benz A-Class: Yes, We’re Getting it! News 2019 Mercedes-AMG A 35: But Will We Get It? First Drives 2019 Mercedes-Benz A-Class: Thrilling!